The four passenger Hughes 500 is flown with the doors off for an exhilarating air tourism experience. Imagine yourself zooming along the spires of the Na Pali Coast with the wind blowing in your hair and looking straight down to the ocean below! This doors off helicopter is not for everyone, but if you are adventurous or are a photographer wanting to get glare free awesome shots, this might be the best helicopter tour for you. The luxurious six passenger A-star is a “flying theater” with skylights and huge floor to ceiling Plexiglas windows for superior visibility. Climate control, Bose noise cancelling headsets, quality narration by the pilot and in-flight music make this the Cadillac of the air tourism industry. See hidden places that can only be discovered from the air. 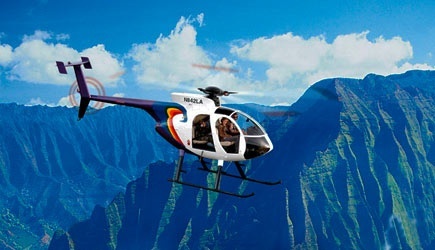 Soar above Waimea Canyon, also known as the "Grand Canyon of the Pacific"
Princeville Airport Tour with Blue Hawaiian Helicopters takes you to Kauai’s majestic mountains, magical sea caves, awesome waterfalls and emerald green vistas. 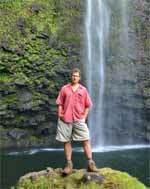 Tour Waimea Canyon, the Na Pali Coast, and much more! Jack Harter Helicopters is available for cruise ship passengers and they will even pick you up at the harbor! We recommend doing your helicopter tour on the morning of your second day in port if you are on an NCL ship, but it can be booked for either day 1 or day 2. 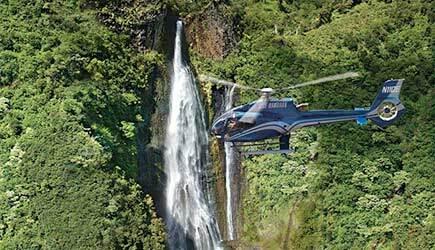 These helicopter tours are a MUCH BETTER DEAL than the ones arranged by the cruise lines. They list their Kauai helicopter tours as a “three hour event” but that includes the transportation to and from the helicopter company and time spend waiting for other people to do their tour. The actual flight time you get for the same amount of money is only 40 minutes or so, compared to a one hour tour with Jack Harter. PLUS we only offer helicopters that offer superior visibility. Longer flights and better views… book your helicopter tour with us! It never ceases to amaze us that people spend thousands of dollars to come to Hawaii, but think it is too expensive to spend another $200 to REALLY see the islands from a helicopter. There is so much beauty that you cannot see any other way. Do yourself a favor and SPLURGE! You will thank us. Best time of day to fly? Mid-morning provides the best lighting and least cloud cover. These times are the most popular and sell out in advance; you have an advantage over most people if you are reading these words before you come to Hawaii. 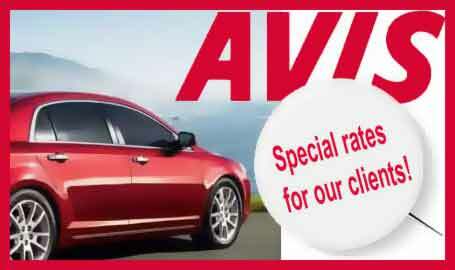 Get your reservation made now so that you can get the best flight time available. Wear dark shirts when you fly in a helicopter. It cuts down the glare from the the windows and improves the quality of pictures that you take. GET A POLARIZING FILTER … it will help remove those little ghostly glares on the windows so your camera can focus on the waterfall. A polarizing filter will improve all the pictures that you take in Hawaii – especially those with ocean and sky…as you’ll see a lot more blues. A word about body weights … almost all helicopter companies in Hawaii charge extra for passengers who weigh over 250 pounds, and Jack Harter Helicopters is no exception. Passengers weighing over 250 pounds or couples whose combined weight exceeds 400 pounds must purchase an extra seat. PLEASE be VERY ACCURATE when you state your body weight … this information is required by the FAA for the weight and for the safe balance of the aircraft. Understating your body weight on the reservation form can cause real problems at flight time and in some cases may cause you to be bumped from the flight without a refund.